We offer four star Conference Equipment and Facilities, as well as Bar Facilities, and are equipped with back up Generators. We also have Faxing and Photocopying facilities available. Focus Groups are most welcome as we do have Facilities and Equipment available. We have an extensive range of menus and pricing available to suit any type of enquiry. We do any type of Function, regardless of the amount of people. Although we have an extensive range of menus to choose from, they are only to serve as guidelines and we still give you the freedom to alter or add according to your specific needs. Our menus and Pricing are very reasonable, as we have come to understand about Budgets and coping with strict financial managers. Our Chef being from an International Hotel Group, and have catered for clients such as Mc Carthy, Honda, Medicross, Maravedi, JD Group, Philips SA, ABSA and Citroen SA, is driven by her absolute Love and Passion for Food and can assure you that all meals are prepared Freshly, with only the Finest Ingredients, on the day of your function. Whether you are looking to bring a bit of adventure into your Training Session while proudly entertaining delegates with Hearty Lunches and Fantastic Snacks, or maybe discover the secrets of cooking with passion while learning to work together as a team, or if you have an Event or Occasion with lots of guests, why not concoct your own menu’s, opt for a Barbeque with friends, dazzle with a Buffet Meal or plan a Reception Dinner… Come Hail, Rain or Shine, and whatever the occasion may be, we at Carfind Conference Centre welcome you, and strive to give only the Best…to the Best! Carfind Conference Centre is situated in the heart of Randburg CBD, and is easily accessible from all major and minor routes. 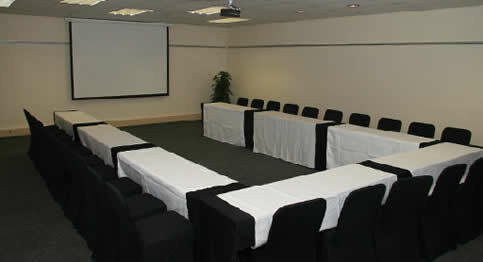 With three superbly appointed Conference Rooms, we can accommodate from 10 to 200 Delegates.